The type 2 ryanodine receptor (RyR2) is an ER-localized calcium release channel that is present in many cell types, including cardiomyocytes and pancreatic β cells. While calcium flux is pivotal for insulin secretion by pancreatic β cells, it is unclear if RyR2 plays a role in insulin release. Individuals with the rare human disease catecholaminergic polymorphic ventricular tachycardia (CPVT), which often first manifests as exercised-induced sudden death, harbor mutations that render the RyR2 channel “leaky”. Gaetano Santulli and colleagues at Columbia University Medical Center reveal that individuals with CPVT also present with glucose intolerance and impaired insulin secretion. Transgenic expression of CPVT-associated RyR2 channels in a murine model (CPVT mice) revealed that these channels are oxidized, nitrosylated, and leaky not only in the heart but also in pancreatic β cells, leading to increased ER stress, mitochondrial dysfunction, and profound glucose intolerance. Moreover, treatment of CPVT mice with a RyR2-stabilizing drug prevented intracellular calcium release, improved glucose tolerance, and increased insulin secretion. The authors further evaluated the pharmacological effects of this drug in both human islets from patients with type 2 diabetes and in established murine models of diabetes. The results of this study identify a link between RyR2-dependent calcium leak and β cell dysfunction and raise the possibility that the relationship between diabetes mellitus and cardiovascular disease might be more complex than previously appreciated. 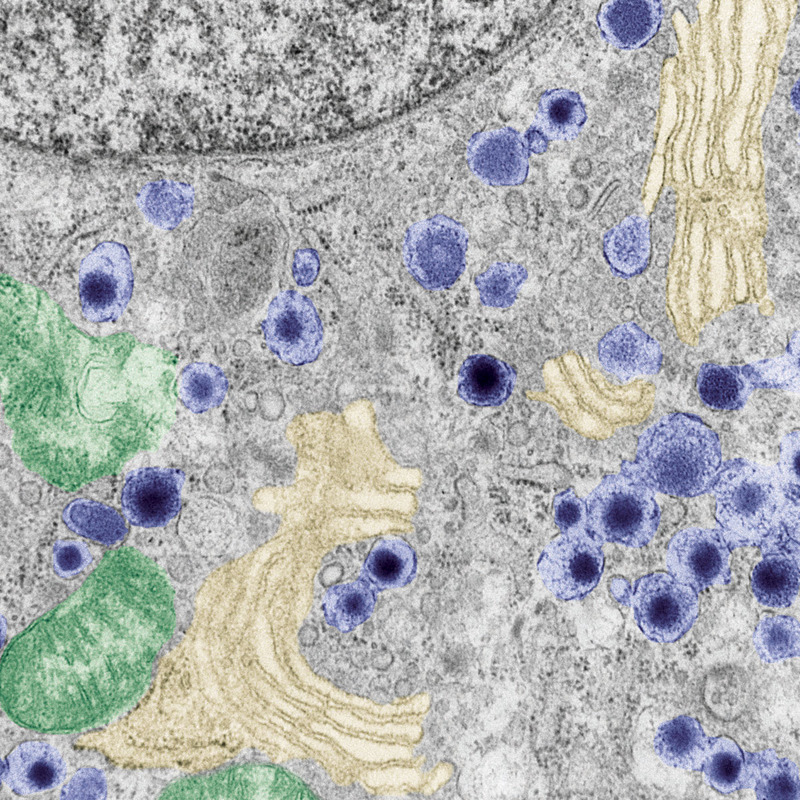 The accompanying electron micrograph depicts the mitochondrial dysmorphology (green) that occurs in a pancreatic β cell harboring CPVT-associated RyR2, which is located on the endoplasmic reticulum (yellow). Insulin granules (blue) can be seen throughout the cytoplasm. Image credit: Dr. Gaetano Santulli, MD, PhD (Columbia University Medical Center). Citation Information: J Clin Invest. 2015;125(5):1968-1978. https://doi.org/10.1172/JCI79273.